Carbide Recycling Company offers many services to aid you in the removal of your scrap Tungsten Carbide, High Speed Steel and other scrap metals. We accept customer delivered shipments. We will sort your carbide scrap, high speed steel or alloys at no charge. 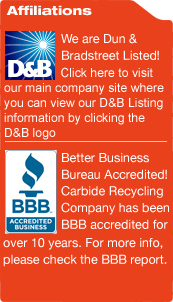 Depending on quantity and your geographical location, we can pickup scrap material at no additional charge. We accept Freight Collect shipments per our specific instructions. We have experience with USA import and export requirements and would be more than happy to assist you with completing all required documents as well as finding the lowest shipping rates. We have been in business for over 25 years and will be happy to provide you with trade and bank references upon request.